It took many years for the pain of losing my father to subside. Through my personal healing, I am now able to look back on my life in a different way. Mesothelioma nearly destroyed my family, but it also forced us to build anew. I could meticulously detail the heartbreak of losing him should I choose to focus only on the loss. Some days I still feel the sadness encroaching on my heart, but for the most part, I center my thoughts on my family’s strength in the face of adversity. My father’s journey with mesothelioma didn’t break him or his family. In some ways, enduring the unthinkable brought my family closer together. During our experience with mesothelioma, my family found strength in each other. Each member of my family absorbed the impact of Dad’s diagnosis differently. We were all in different places in our lives: I was barely a teenager, my sister was 17, and my brother was a grown man. My brother was newly married and had a wife to support. My sister focused on school and work. My dad was a very humble man and did not want to burden his family with his illness. My brother and sister loved Dad immensely and helped out when they could, but my father insisted they tend to their work and school. Then there was my mother and me. We had the typical mother and teenage daughter relationship. I thought she was overbearing and annoying, and she thought I was rebellious and selfish. No matter what we had going on in our lives, Dad’s illness demanded our prompt attention. Mom became my father’s caregiver, and I took over most of the household duties. Dad’s sickness placed us in a position where we needed each other more than ever. It was during some of our sleepless nights spent at the hospital that I realized my mother’s strength and developed a newfound respect for her. Late one night in the spring of 1993, Dad’s health took a turn for the worse. Mom and I rushed him to the hospital. It was there that I realized how much I needed my mother. The issues that divided us melted away in that chilly hospital waiting room. We spend the night leaning on each other — literally. The only warmth I could find was to huddle next to her, and the only soft place to lay my head was her shoulder. Dad’s nurses insisted we only visit in short intervals, which meant my mom and I had plenty of time to ourselves. That night, I saw her, not just as my mom, but as my father’s wife of 22 years. I saw her worry for her soulmate. I could see her sadness, loyalty and strength. It was then that Mom became more than just my parent. She became my friend. Upon my father’s release from the hospital, things were a little different at home. My mother and I were closer than we had ever been. From our experience in the hospital waiting room, I learned that we needed each other. Rather than shut my mother out of my room, I would welcome her company. After my dad went to sleep at night, she would sit on my bed. Some nights, I would tell her about a boy at school or homework assignments; other nights, we would just sit and cry together. I gained a deeper understanding of the terror she faced. I understood her fears: Being alone, parenting alone and becoming a widow. Melanie’s mom enjoys an intimate moment with her husband Richard. After my father’s passing, my mother and I moved closer to her relatives. It was a tough transition, but I came to rely on the mother-daughter bond forged in the hospital lobby. I struggled to adjust to rural life after growing up in the suburbs. I hated the remote location, and I missed my friends back home. I felt as though Mom needed me, so I poured myself into settling our new home. When school started, Mom was there to hear my cry about how much I hated being the new kid. She reminded me of why we moved in the first place and that building a new life would take time. At the time, I didn’t comprehend her decision to move was about her healing, not just mine. 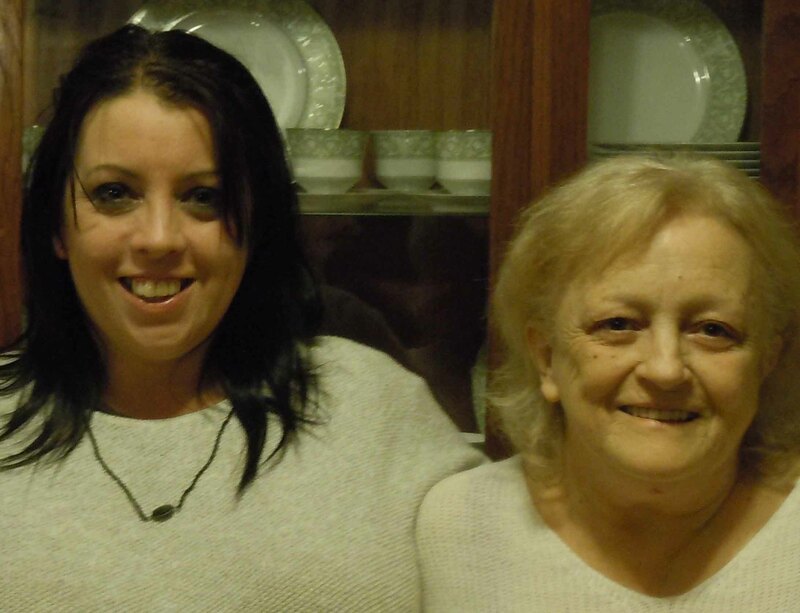 Perhaps no other person felt the impact of Dad’s battle with mesothelioma more than my mother. She lost her husband of more than 20 years, her best friend and confidante. For her, adjusting to life without Dad is an ongoing process. A few years ago, my mom returned to Ohio to be near my brother and sister. Mom and I talk on the phone almost daily, and we video chat occasionally as well. My busy graduate school schedule doesn’t allow for much travel, but we make it up to visit when we can. Although our relationship changed for less than ideal reasons, we have never been closer. Families dealing with mesothelioma will see the illness can bring out the worst in people, but it brings out the best in them as well. Fighting a common battle strengthens strained family bonds. Growing up, I was always a Daddy’s girl. I thought my dad hung the moon and stars, and when he got sick, it crushed my spirit. Somewhere in my brokenness, I found my mother. Her strength and willingness to help showed me that I was not in this alone. My father needed all of us, and his needs superseded our family issues. His illness bonded us in ways we never thought possible. If your family is in the midst of crisis associated with mesothelioma, take a moment and look around. You may find the strength and courage you desperately need in the faces and hearts of those around you.